Near my hometown Zutphen, in the central-eastern part of the Netherlands, a lot of old estates can be found. Several of them have beautiful plantings of old trees, especially beech and oak. I like to show you some of the outstanding specimens. 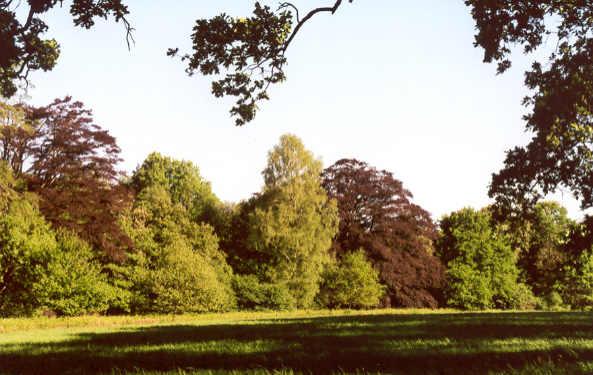 Here you see a forest-border on the Estate of Den Bramel, near Vorden, with some marvellous Purple Beeches. My wife Gerdien with the big Purple Beech ( Fagus sylvatica 'purpurea' ) of Den Bramel, with its circumference of 7,4 metre (over 24 feet), height of 27 m (90 feet) and crown spread of 35 m ( 115 feet ) one of the largest and most impressive beeches in the Netherlands. As most Purple Beeches it was grafted upon a rootstok of common beech, what can be seen from the bumbs and gnarls on the trunk. It will be planted around 1775 , so it is a lot younger than most oaks of the same circumference. The somewhat lesser sister-beech at the left on the first picture died a few years ago: it had been weakened by large fungi and was trown over by a storm. More pictures of the Big Beech. Nearby stands this gnarled Eastern Plane-tree (Platanus orientalis) ; this South-east European species does not grow fast in the Dutch climate, while it is vulnerable for severe frosts. 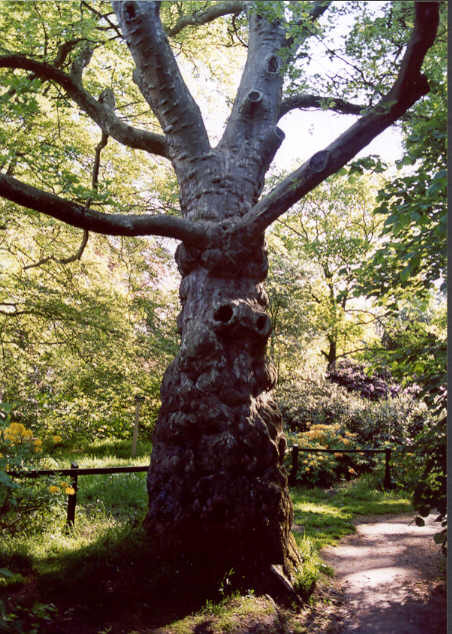 It is far less planted then its descendant, the hybrid London Plane, and it grows mostly with a short bole full of knobs and faces. Still, it makes a delightfull tree. 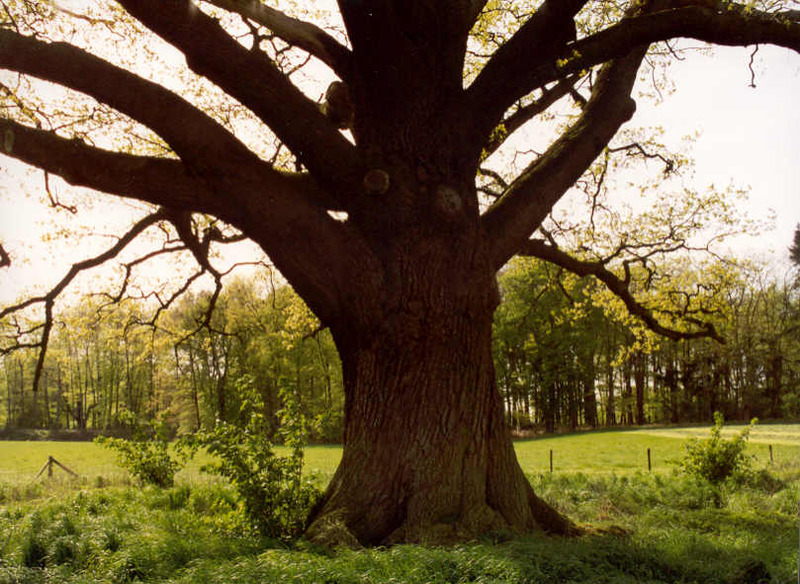 The Giant Oak ( Dutch: Reuzeneik) , near the village Vorden, indeed is one of the most imposing oaks of Holland, with its huge crown spreading nearly 40 metres ( 130 feet) and its bole of 6,9 m (22,6 feet) circumference at breast hight. It stands beautifully in the open meadows near the Castle of Vorden and will be somewhat over 300 years. In Holland as well as the rest of North-Western Europe there are two native Oaks, the Common (also called Pedunculate or English) Oak, Quercus robur, and the Durmast or Sessile Oak , Q. petraea. In Holland 98 % of the native oaks are Common Oaks. The Sessile Oak is growing in some old forests on well drained sandy soils in somewhat hillier parts of the country. In fact the second common oak in Holland is the introduced American Northern Red Oak, Q. rubra. More pictures of the Giant Oak.